Free in the Sea is our personal blog and our personal journey of the freedom and the happiness we’ve found in breaking free from the norm and chasing a different way of life. Living and travelling on our sailboat, we’re learning to live a more sustainable existence and to find meaning in our connection to ourselves and our environment. We believe in the power of each individual to make a difference and we’re joyfully trying to contribute to making this planet a better place, using our lives as an example and sharing what we’ve learned along the way. I’m Isabel Romero and I was born in Ecuador but have lived on the Gold Coast, in Australia since 2005. My husband, Michael Warwick was born in Brisbane but he moved to the Gold Coast in 2004. We didn’t meet in Australia, although we were both living in the same city for many years, but in Hawaii in March 2008 while on holidays. At the end of that year, when I returned to the Gold Coast, our story together began. Part I: For 5 years we planned our escape from “normal” lives. Finally on December 2013 we sold all our unneeded belongings, quit our jobs and grabbed a plane to Ecuador where we spent 8 months of surfing, travelling and being free. We found our new floating home in the BVI in the Caribbean, a Benetau 373 called Ondular, and after months of working on it, we set sail and explored the Eastern Caribbean for most of 2015. 2016 brought us to the Pacific Ocean after crossing the Panama Canal. We spent several months in Panama and then sailed to Ecuador and the Galapagos. In April we crossed the Pacific Ocean and arrived in wonderful French Polynesia, where we decided to leave Ondular, safely out of the water, and return to Australia for a few months to make some more money. Our sailboat is a Beneteau 373, made in France in 2004 that we bought from Moorings in the BVI in September 2014. Free in the Sea: 2014 until now. We believe that as individuals we hold great power. 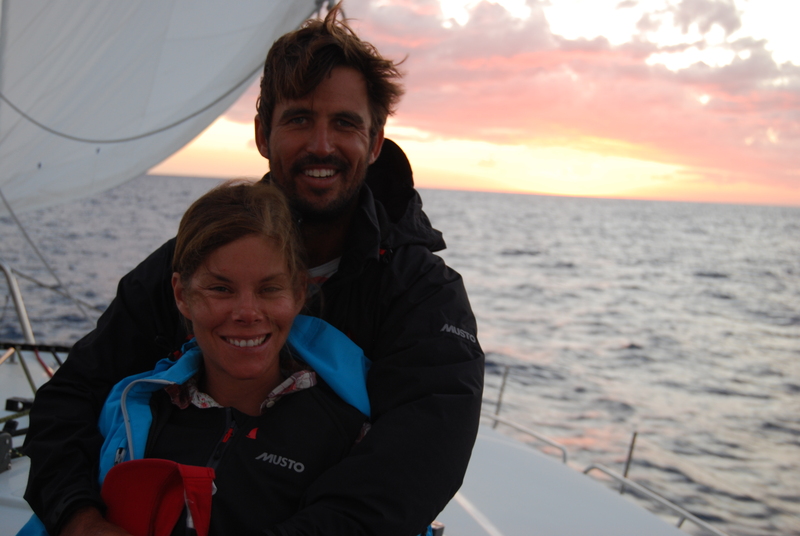 By our daily choices we are communicating a clear message about what kind of world we want to help shape.Free in the sea, this is us, two people, living and travelling on a sailboat, doing their part. How do we do this? By collecting discarded materials from the islands we visit and creating new things out of them.Wherever we go, we try to leave the places we visit, in any way possible, better than what we found them. We look for organizations to work with and contribute in any way we can. We continue to spread the message about plastic pollution in our oceans and what we can all do to make a difference. Ayni 11×11: June-July 2017. We created a video and delivered workshops to teach the community in Ecuador how to make doormats out of plastic bottle lids. By getting some schools, universities and individuals involved, in a manner of 3 months, we were able to build a big mat that was showcased in a two day event in the city of Guayaquil. The main goal of the event was to provide a space for Mingas por el Mar, different organisations working in the country in conservation projects and eco-friendly entrepreneurs to showcase their products and talk to the community about their efforts. During the event we organised workshops, talks, yoga classes, music and art and it was a day for people to learn more about the efforts of these organisations and what we can all do to make a difference and reduce our negative impact on the environment. We would like this event to be an annual thing to happen in Guayaquil and in other cities in the country. When we started this journey we thought we would do it for a couple of years and slowly return with the boat back to Australia. That’s still on the cards but we want this adventure to continue for a few more years. This second part of the journey will take us back to Polynesia. This time around, our plans are more open than the first time: no set schedule, no set route. We’ve learned a lot from this experience, even more now that we had to return to our old lives and jobs. It’s made us appreciate our life on Ondular so much more. We are certain that there’s a real richness in living this kind of life: a simple life, with less possessions but more time. More time to explore, learn, share, and give back. This is the second part of our journey, an adventure into downshifting, living a more sustainable life and listening to our spirits. We’d like to share it with you! Isabel, la ultima vez q nos encontramos por casualidad fue en Montañita hace muchos años. Que increible escuchar q te vaya tan chevere y q estes emprendiendo tremenda aventura bien acompañada. Les deseo salud, aventuras inolvidables, amor y mucha paz en todo vuestro recorrido. Si pasan por Olon, están bienvenidos en Hostal Oloncito. Isa y Mick buenas vibras!!! amor, salud, suerte y mucha diversion en su vida de aventura!